The sharing economy is taking over. After the success that Turo has had in providing car owners a place to rent out their unused automobiles at reasonable prices, I’m not surprised that someone has found a way to parlay that into the world of motorcycles. That’s the stated purpose of Twisted Road. In a piece for the Los Angeles Times, founder Austin Rothbard was on vacation in a scenic locale with no way to rent or borrow a motorcycle for the great roads. He even checked on Craigslist to see if he could buy a bike for a quick ride and flip scheme. 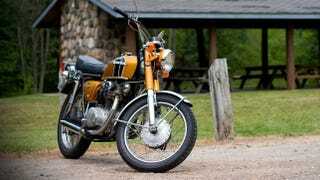 Being a motorcyclist, he knew that there were bikes hiding out in garages all over the country that are rarely ridden, and with Twisted Road aims to connect dormant bikes with riders like him who wanted to rent them. Having looked at the service a bit, it seems most motorcycles rent for around 100 dollars, some as low as $75. In fact, close to my house is a BMW R1200RT for rent at $110 per day. For that fee, I can swing my leg over someone else’s 110 horsepower 1200cc BMW highway bomber bike. That’s a great opportunity for an extended test ride to see if you like that kind of bike, or just for a change of pace when you’re out of town. Do you want to ride a big touring bike for a few days? This site has you covered. In exchange for hosting the deal, Twisted Road takes 30% of the transaction cost off the top. You can pay extra to cover roadside assistance. Extra services like pickup, dropoff, and gear loans are at the discretion of the owner. To put the bike owner at ease, all renters are required to provide proof that they not only own their own motorcycle and are active riders, but must carry their own motorcycle insurance policy as well. The motorcycle market is a small fraction of the automobile market, but Rothbard seems confident that he can get people to come around to the idea. Considering there are currently over 440 bikes available to rent nationwide right now, it seems the idea is catching on with some. Would you rent out your motorcycle? Would you rent someone else’s motorcycle?